10) It's promotional material for "Weekend at Bernie's 3: Dead on the Diamond." 9) It's an actual dead man being propped up for entertainment purposes. 8) It's one of those things that you stand behind and place your head in the cutout for photos. 7) Considering his hands are as big as his head, it must be George "The Animal" Steele in disguise. 6) It's concept art for the unwanted sequel to "Semi-Pro." 5) Topps was just putting its surplus of wood-grain framing to good use. 4) Oh, like you don't have glossy photos of Tim Stoddard that you're just dying to have autographed. 3) It's entirely possible that this is a photo of Tim Stoddard burping while sleepwalking. 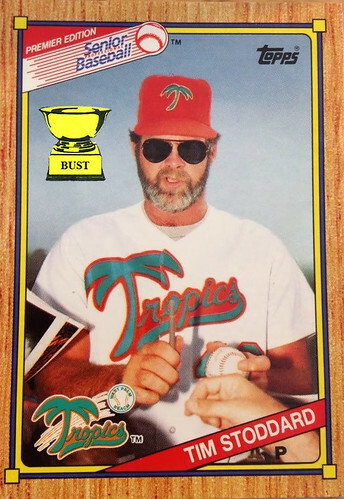 2) It's just a cheap rip-off of this Al Hrabosky card. 1) Clearly, this was the liveliest photo from the entire Senior Professional Baseball Association season.